Named for a cascading stream that runs throughout this picturesque golf course, Raccoon Creek will serve as the perfect setting for your special occasion. Steeped in tradition, Raccoon Creek was formerly the old Grant Ranch, which was originally acquired by Governor James Benton Grant in 1878. 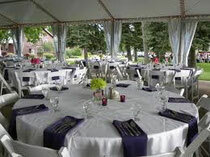 Raccoon Creek and its scenic beauty are sure to please all who attend your memorable affair. They have a newly-built tented area surrounded by beautifully landscaped grounds that have breathtaking views of both the golf course and the Rocky Mountains.